The shipping was fast via UPS. Boxed well with an inner box and bubble wrap. Light oil. Sharp. A little whippy with about a 10" flex. In think that throughout the world Kris blades were scary as the alleged curly blade a better cut. Seems so even with the pike sliding down to the hands. I do not think, nor am I knowledgeable about cutting through a staff wood. Heavy in the hand grip but effects a light blade with QUICK response. Overall I am very pleased with this Kriss Sword and would recommend it for display. Oh Yes, the leather was exceptional tight and well formed. Long grip. Fair quality real leather scabbard and over the shoulder straps. 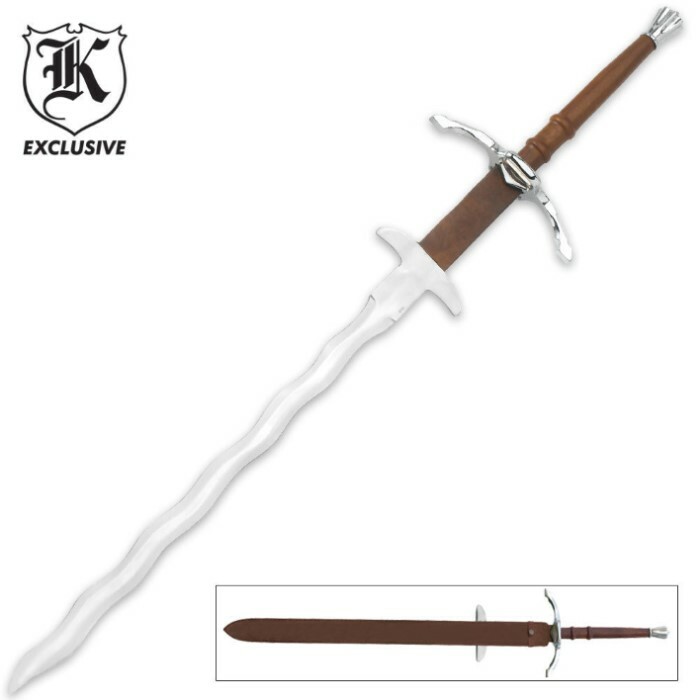 this is an excellent sword though the blade is thinner then it is supposed to be plus its a bit shorter too. also the correct name for it is Flamberge (German for flame blade). Nice Sword. Great service. Beautiful addition to any collection. This sword is fairly well-built; there's some play in the leather handle covering and the blade is thinner than I expected with a lot of wobble. Overall this sword is a great wall-hanger but I wouldn't recommend it for use. The leather sheath is very nice and holds the sword well. It's pretty heavy for its size; most of the weight is in the handle. BTW the correct spelling is "kris" after the Persian/Indonesian kris knife (same blade type).